Southbend has introduced a new charbroiler that is a real space saver. The Southbend Heavy Duty Counterline Charbroiler, Model HDC-12, is only 12 inches wide! Increasingly, operators are trying to offer more choices for their customers using the same amount of kitchen space. Whether working from a concession stand, food truck, or small kitchen in the back of a café or bar, those operators just may not have enough room for a full-sized charbroiler. Other operators may have the space, but if they’re only grilling, for example, chicken and beef satay appetizers, then investing in a full-sized charbroiler may not make sense. Either way, the Southbend HDC-12 is a hot little unit. Each of its two independently operated burners generates 20,000 BTUs using LP or NAT. Stainless steel front and sides are standard. The double-wall sides are also reinforced and insulated. 5-inch splashguards keep grease where it belongs, and the two-position reversible grates feature wide or narrow branding. The unit can also be converted in the field from cast iron radiant to briquette cooking. The HDC-12 can be mounted on four-inch legs or flush to the counter. 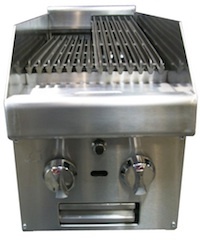 Other available options include a battery spark ignition, 2-inch high insulator base for mounting above refrigerated units, a stainless steel stand with or without casters, and plated grids for cooking fish. It’s a lot of charbroiler in a narrow footprint … and that’s the skinny on the new Southbend HDC-12.